The Center for Autism and the Developing Brain (CADB) offers Early Intervention services to children 12-36 months old suspected of having an autism spectrum disorder. According to the New York State Department of Health, "The New York State Early Intervention Program (EIP) is part of the national Early Intervention Program for infants and toddlers with disabilities and their families. First created by Congress in 1986 under the Individuals with Disabilities Education Act (IDEA), the EIP is administered by the New York State Department of Health through the Bureau of Early Intervention." 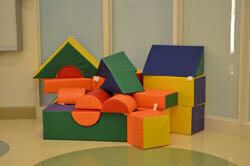 Play blocks at the Center are colorful and soft. A variety of services are offered to children and their families through the Early Intervention system. As indicated above, in order to be eligible to receive these services, children must be under 3 years of age and have a confirmed disability or developmental delay, in the areas of physical development, cognitive development, communication, social-emotional, and/or adaptive. Our focus is on the assessment and treatment of children with autism spectrum disorders, though we will see children with overlapping conditions if we feel that we can provide appropriate services.